We set off along the coast. Be lazy on your 1st day and stay on board. Enjoy some relaxing swimming and sunbathing. Or take a more active optional trip to Dalyan and Caunos. This is a day on a little river boat down the narrow, reed-lined waterways. Amazing Lycian rock tombs. Caunos, an ancient site with theatre, acropolis and tombs to explore. Lunch in a river-side restaurant. Try the famous mud baths, and get 10 years younger in no time! Turtle beach with its white sands, where Caretta Caretta Turtles still lay their eggs. 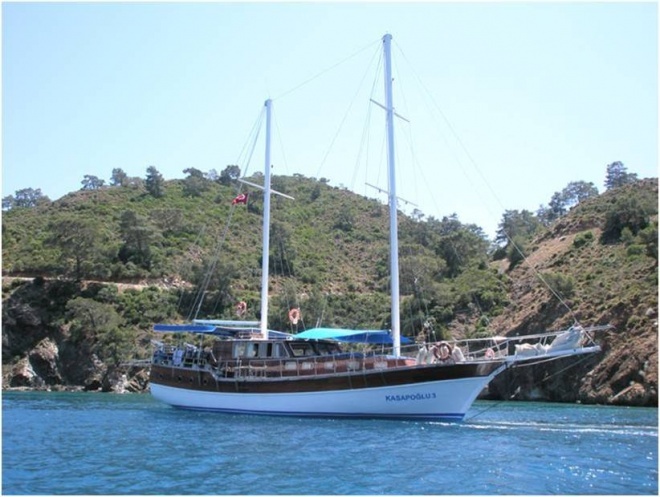 Transfer to our Gulet in Ekincik bay. Dinner . Setting sail after breakfast, we cruise to Agalimani. Swimming and lunch here. In the afternoon, arrival in the bay of Manastir. Swimming breaks here and in the neighborhood (Cleopatra and Hamam bays). Dinner and overnight. Breakfast. Today, we sail in the 12 Islands Area. Tersane or Yassica Islands. Late in the afternoon arrival in Fethiye for dinner and overnight. Breakfast. It is time to say farewell to your crew and gulet . Transfer to airport . Flight to Istanbul. After arriving transfer back to Hotel .